Wiedeking (center) arriving at court today with Haerter (second from right). Both executives were acquitted. 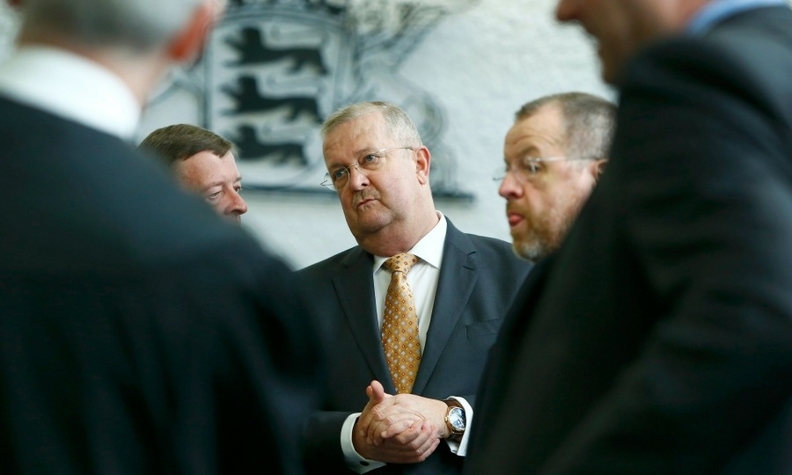 STUTTGART (Bloomberg) -- Former Porsche CEO Wendelin Wiedeking and ex-Chief Financial Officer Holger Haerter were acquitted of charges that they manipulated shares of Volkswagen Group in a failed 2008 takeover bid. The decision is a boost for Porsche, which is facing civil lawsuits by shareholders making the same allegations that the pair misled investors about the bid. The trial of the two former executives, which began in October, ended today with dismissive remarks by the judge who cited a long list of bad conclusions by prosecutors. "There is nothing to the allegations, absolutely nothing," Presiding Judge Frank Maurer said when delivering the verdict. "There was no secret plan to take over VW." The case centered on Porsche’s statements about VW in 2008. From March to October that year, the company denied five times that it was seeking a takeover. When the carmaker reversed course on Oct. 26 and disclosed that it held 74.1 percent of VW, partly through options, short sellers scrambled to cover their positions and drove up the price of VW shares. Porsche gave up the plan after funding dried up amid the financial crisis. In the end, Volkswagen had to rescue Porsche, buying the automotive business and leaving a holding company, whose only asset is VW shares, as the publicly-traded entity. Shares of Porsche Automobil Holding SE rose 86 cents, or 1.9 percent, to 45.65 euros today after jumping as much as 2.5 percent following the acquittals. VW shares climbed 1.50 euros, or 1.3 percent, to 116.30 euros. The Porsche case dominated local headlines for years as the highest profile crisis by a German automaker, but has been eclipsed by the emissions scandal at VW. While VW wasn’t involved in the trial, Porsche is. Plaintiffs in civil suits are seeking as much as 5 billion euros from Porsche. Lawyers in those cases were hoping that the criminal trial would reveal evidence that could bolster their cases, which have been slowed by the German legal process. Prosecutors had asked for prison terms of 30 months for Wiedeking and 27 months for Haerter plus fines of 1 million euros ($1.13 million) for each. They also sought a fine of 807 million euros for Porsche. "From no viewpoint of the facts could we have rationally come to a conviction," Maurer said. The judge said prosecutors misread Porsche's moves to come to a view that Wiedeking and Haerter had committed to a takeover in early 2008. The reality, he said, was the executives considered several options during the year, based on briefings on the chances and risks involved. All those testifying who had worked with the executives denied that a final decision was made before Oct. 26, 2008, the judge said. Prosecutors were attempting to use hindsight and documentation to make allegations that the path was decided much earlier in the year, he said. "Is it possible that Wiedeking and Haerter were long determined to go for the takeover and the people working closest with them didn’t notice a thing?," Maurer stated. "That would be like Julius Caesar going to war and nobody had a clue." The discussions at Porsche were open and there was "no trace" of a secret decision to pursue a takeover, he said. It wouldn’t have made sense for the pair to go over options with lawyers and consultants if they’d already decided on a bid, Maurer said. "Or do prosecutors think Wiedeking and Haerter staged a puppet theater over months to have a defense ready for a possible criminal trial?" the judge asked.